Julien Stropoli raised the :::Ah:::6h from the cutoff, Daniel Jacobson called on the button with :::As:::8s and Henri Piironen peeled with :::5c:::2c. Piironen checked the :::4s:::Ad:::7d flop, Stropoli bet 80,000, Jacobsen called and Piironen folded. Stropoli checked the :::Qc on the turn, Jacobson bet 160,000 and Stropoli called with his weaker ace. Stropoli checked the :::Qh river to Jacobson. 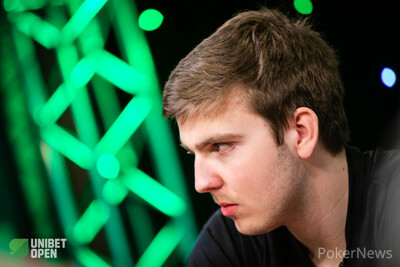 The Dane shoved all in for 350.000 and Stropoli called after ten seconds. The kicker played and Jacobsen doubled up.